We are a community of believers committed to sharing the unconditional love, everlasting mercy and unending hope found in a personal relationship with Jesus Christ to our communities and to the world. We are committed to meeting the needs of the individual: giving hope, igniting passion and restoring relationships and helping you fulfill your God given destiny. Come and worship with us as we experience the power and the presence of God in a real and exciting way. 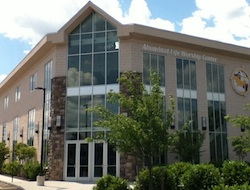 Abundant Life Worship Center is a culturally diverse ministry that was formed by the will of God and by the pastor and founder, Joseph Leo. Pastor Leo, a business owner, founded Abundant Life Worship Center after hearing the call of God to start a ministry that would not only impact the world but also demonstrate the power of God. In the beginning the church met in various locations ranging from churches to homes to the North Stelton Fire House in Piscataway, NJ. Today, we are blessed to have moved in to our new church facility located at 482 Stelton Rd in Piscataway NJ. God has built this ministry from a small gathering of believers to a church of over 600 members, with multiple worship services and a number of diverse ministry departments. Through our worship services, fellowships, ministry departments, outreach endeavors and missions, we are meeting the needs of our community and impacting the world with the Gospel of Jesus Christ.